Dental patients around the world now have a new reason to fear dentists: a drill bit came loose during a dental procedure and fell into a woman’s lung. During a routine dental-implant operation, a 60-year-old woman bit down on the dentist’s drill head, causing the drill bit to become loose and then fall into the woman’s mouth, down her throat, and into her right lung. Immediately, the dentist asked the woman to sit up and spit the drill bit out, but it was too late – the damage had already been done. “She tried to spit it out, and was made to cough, but she’d already swallowed,” said Per Weitz, medical chief of the hospital tasked with removing the drill bit. In response to the woman swallowing the drill bit after the accident, the dentist proceeded to x-ray her chest. Seeing the drill bit firmly stuck in the woman’s lung, the dentist contacted doctors for assistance. This was when “a pinky-sized tube was sent into her lung with a small camera and pliers to grab hold of the drill,” said Weitz, who said it was a standard bronchoscopy procedure. The dentist clinic where the incident happened now checks each drill bit before starting a procedure, making sure the drill is properly attached. Also, the dentists check the drill bit in the air before using them. “Unfortunately, drills are going to be dropped every now and then,” said Weitz. 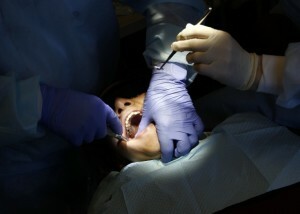 To prevent such further accidents, scientists are searching for dental drill alternatives. For example, researchers at the University of Missouri created a device that uses gas and liquid to remove plaque and kill bacteria. The device is said to be pain-free, and the lack of a drill bit helps to avoid accidents such as the one above.